The long running campaign in Hackney saw the eviction of Broadway Market and the occupation of Dalston Lane theatre this week in a struggle that looks set to continue for some time to come. As you may have heard, the occupation was evicted from 34 Broadway Market on Thursday morning after nearly 4 months. The cops supplied the full riot squad treatment, though this was gradually stepped down, and no one was hurt. Typically the police cameraman videoed the group of 20 or so protestors outside the cafe throughout and they deployed metal barriers to keep us at bay. As usual, when members of a community protest they - and not the developers who have been handed the area on a plate - are the ones treated like animals. So, for now we are out but definitely not over. Negotiations with 'community minded' developer Dr Wratten are still on and we are pursuing our plans for a community redevelopment of the site - watch this space for more news! In the meantime, we need to keep the pressure on the council to make sure that, eviction or no eviction, we get justice for Spirit and Tony. COME TO THE COUNCIL'S INVESTIGATION INTO COMMERCIAL PROPERTY SALES! SHOW SUPPORT FOR TONY & SPIRIT AND ALL OTHERS AFFECTED! At the last full Council Meeting a motion was passed that a review panel be set up look into Commercial Property Sales in Hackney over the last decade. This enquiry will particularly examine the cases of Tony and Spirit and the units in Dalston Lane. Hackney Council's Governance & Resources Committee has met and agreed to hold three meetings to hear evidence and examine documentation. The committee has also recommended considering the situation of those affected by property disposals in the past. So far Labour have only discussed making sure that such things 'don't happen again'. This means we could see compensation for people like Tony & Spirit. The appointed review panel will be made up of four councillors: James Cannon (Labour), William Hodgson (Labour, Queensbridge Ward), Andrew Boff (Conservative, Queensbridge Ward) and Elaine Battson (Labour, Dalston Ward). The enquiry will be open to the public and will take written and verbal submissions from any interested parties. Unfortunately, as the council is being dissolved on the 24th March for the pending local elections, the Commission will have to be concluded before that date. This means there is very little time to consider evidence and draw conclusions. The Commission will sit over the next three weeks - on Monday 27th February, Monday 6th March and a final date to be confirmed in the week of the 13th March. It is crucial that the council see that the support for this issue is as strong as ever and we urge local people to come along to the meetings at the Town Hall. The outcome of this could mean a major breakthrough in the campaign for Spirit & Tony! HACKNEY COUNCIL SOLD OFF PROPERTIES FOR HOW MUCH?! Numbers 11-17, 25, 33, 47, 49 & 67- 9 properties sold for £250,000 total to Stirling Properties Ltd based in Moscow (payments over 6 years). Number 31 sold to Stirling Directors for just £63,500. 30 - 32 (Market House Pub) sold to Dr Wratten for £30,000. 55-61 Freeholds sold for £3,000 each to Broadway Investments Ltd (who went on to buy Spirit's property). properties) and gifted to Dalston Lane Investments Ltd (Spirit's landlords again!) for £1.8m. So much for 'Best Consideration'! Overnight on Sunday 19th February supporters entered the former Dalston Lane Theatre (formerly the Four Aces Club and Labyrinth) and the 2 Georgian houses which adjoin the theatre. The occupation is in protest against the sell off of the site to developers and to prevent the demolition of a building with a rich history as a cultural centre for many different members of the local community. We need cultural and social resources for everyone in the area – not more unaffordable apartments! Council contractors arrived on Monday morning and there was a stand-off for several hours between the occupiers and the Council and police. It has been agreed that the contractors will only make safe the main theatre building to allow English Heritage to examine its many beautiful architectural features, some of which date back to 1886. The occupiers continue to hold the bulk of the complex and intend to stay in place for some time to come. At their Planning Committee meeting earlier this month, the Council stated that they aimed to present a cleared site to developers within 8 weeks. We now hope to stop that happening. Hopefully, this may mean that there will be no 18 storey luxury apartment blocks built on this site – and no development should mean no demolition! We believe that, if the community were actually consulted on this matter, people living here would have better ideas about what to do with this building! HELP KEEP THE THEATRE OCCUPIED - FOOD, BEDDING, HEATERS ALL URGENTLY NEEDED! We are working with the occupiers and are providing logistical support until a local network to help out can be established. Anyone who is able to help out with bedding, gas heaters, food (mainly vegan) or with a few spare hours to hand out leaflets in Dalston Lane and to collect petition signatures is asked to contact 07946 587960. 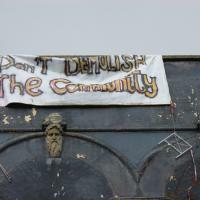 At a hearing in the High Court on Tuesday 21st February, the Court agreed that OPEN-Dalston (a local community group opposing the demolition and redevelopment) were quite right to bring an action against the Council to seek a judicial review of the plans to demolish the theatre site. As a result, the Council must pay all Court costs. Unfortunately, as the Council has now granted itself permission to demolish the buildings, nothing other than an occupation can realistically prevent the demolition from going ahead. So the fight goes on! Please get in touch if you would like to lend your support to the occupation.